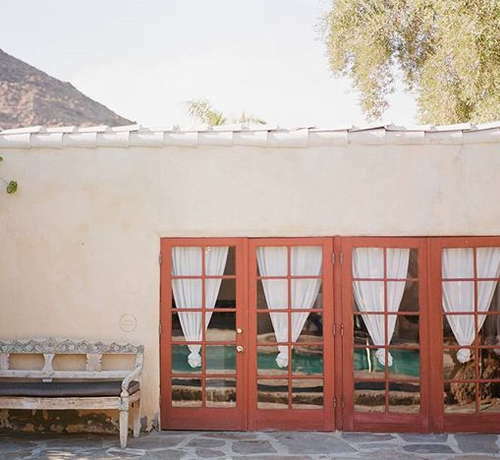 This Mediterranean style bed and breakfast bills itself as a retreat. 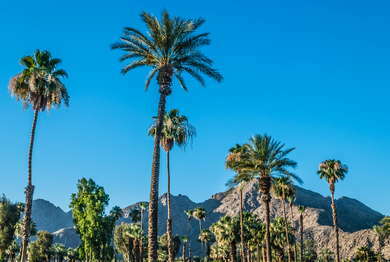 In the heart of downtown Palm Springs, the Korakia Pensione (the name translates to “Crow Hotel”) is a magnificent oasis made up of multiple buildings spread across an acre and a half. The heavy stone, almost tiki look, exterior spreads from the outside to the rooms and villas inside. The 28 intimate spaces are separated between two parcels, dubbed Mediterranean Villa and Moroccan Villa. Fourteen are suites, two of them larger “House” suites, and two of them freestanding bungalows. 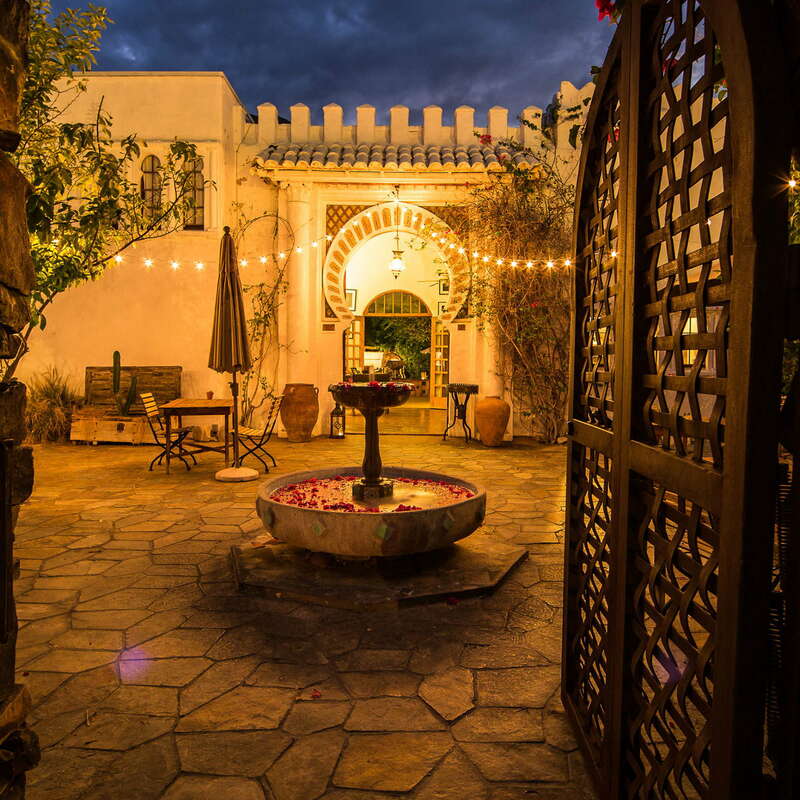 The spaces provide no televisions or screen of any kind and are decorated with weathered wood and Italian farmhouse fixtures or magnificent Moroccan lanterns and candles. Some units have wood-burning fireplaces. Decked in floors made of large stone, the bathrooms are the least exciting part of this property. Many have a pedestal sink and combination tub/shower, while others have more interesting sunken, grotto-style tubs. Suites and villas have impressive stone showers, walls, and floors. If you really want to treat yo’self, book the Orchard House, an extra-large suite built in 1918 whose jetted soaking tub also has a waterfall. Guests enter the grounds on the Moroccan side of the estate, through a Moorish cut-out and impressively tall carved doors. The adjoining library is a superb little hangout spot. Each side of the property has its own salt water pool, which is heated seasonally and open 24-hours per day. The patio areas offer splendid views of the San Jacinto, as well as hammocks and cafe tables. Guests can book massages in-room or in the separate massage lodge. Yoga is offered on weekends (or private sessions can be arranged). Meditation classes are also offered on a revolving schedule. Over on the Mediterranean side, guests will find a bocce court if the urge to toss a few balls around leisurely strikes. Start each morning with a complete breakfast, served on the gorgeous Moroccan patio. Guests can also arrange to have breakfast delivered to their room. A lunch menu is available with service offered poolside, in one of the estate courtyards, or in room. Afternoon tea is served, Moroccan style. Cruiser bikes (with helmets) are provided to guests who wish to cycle around the neighborhood’s shops, restaurants, and cultural attractions. Jump on the city’s free shuttle, Buzz, to traverse a loop throughout the main part of Palm Springs. A car is needed to get to many places in the Coachella Valley, including the tramway, preserves, and hiking trails. Travel from one delight to another at Spencer’s Restaurant (3-minute walk), known for its al fresco dining and upscale, healthier menu. Or, throw your diet out the window at Pomme Frite, a Belgian bistro with decadent pâté, steak frites, and mussels. The desert’s favorite Jewish deli is Sherman’s Deli & Bakery (13-minute walk), known almost as much for their matzo and Reuben as they are for towering cakes. The legacy piano bar in the desert is definitely Melvyn’s Restaurant & Lounge, an upscale joint and longtime celebrity hangout. If all the stone surroundings at the Korakia have you hankering for a tiki bar, the Tonga Hut (13-minute walk; 4-minute drive) is the Palm Springs outpost (opened in 2013) of an L.A. hotspot that’s been around since the height of tiki culture in the late 1950s. This is an experiential hotel, with an ethereal vibe and an emphasis on relaxation. 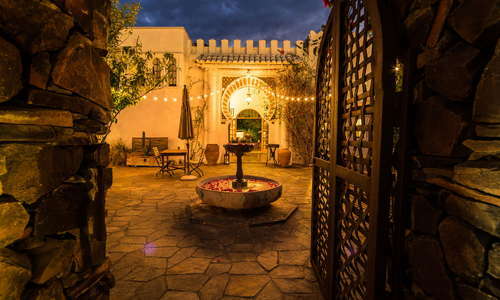 For a romantic weekend or to get away from tension mid-week, this moody lodge is the perfect getaway, especially for guests who have spent time in Greece or North Africa (or wish they had). The location is terrific for access to many Modernism Week or Palm Springs International Film Festival events. Speaking of movies, vintage movies are shown nightly on one of Korakia’s outdoor patios.